For the past year, the U.S. has been throwing around the idea of establishing a “Space Force” to prepare it for off-world warfare. 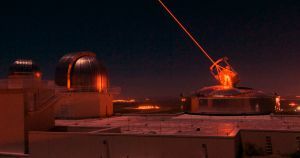 On Monday, the public got a clearer idea of just what kind of battles the nation expects might be on the horizon: satellite attacks by laser weapons. In other words, the real world is sounding more like “Star Wars” every day. On Monday, the Pentagon released a report titled “Challenges to Security in Space” in which a key claim is that Russia, China, Iran, and North Korea are in the process of developing technologies they could use to attack U.S. satellites. The importance of satellites to modern life — not just modern military operations — is nearly impossible to overstate. The devices play an integral role in our abilities to communicate with one another, navigate the world around us, study important issues such as climate change, and much more. If one nation did want to wreak havoc on another, taking out its satellites would certainly do the trick. So if the intel behind the Pentagon’s new report is solid, it’s imperative that the U.S. find ways to counter any laser threats to U.S. satellites — no matter how much they may sound like science fiction. The post Pentagon Warns That Enemies Could Shoot US Satellites With Lasers appeared first on Futurism.